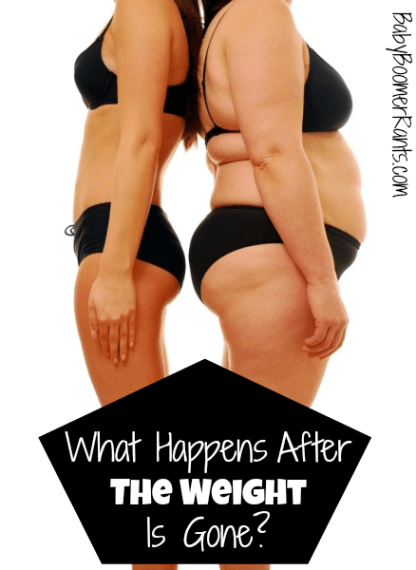 What Happens After The Weight Is Gone? You are here: Home / Weight Loss / What Happens After The Weight Is Gone? I remember when Kate Gosselin had her plastic surgery donated to her to remove the extra skin she had in her stomach after having the sextuplets. I am not up for plastic surgery, that is not something i think I would want to do. Although I had thought about implants until a friend told me you have to have them replaced every 10-15 years – did you know that?! I didn’t, that changed my mind and quick! But, more than physical there are mental things to deal with. Even now, and I lost over 100 lbs about 4 years ago, I buy clothes that are too big for me. I shop in the wrong size section. I am looking for ways to hide my belly and backside. All things I did when I was fat. But, when I look in the mirror and when I am shopping I am still that fat girl. It’s hard to switch gears. A few years ago, pretty quickly after I had lost the weight, I was at a blogging convention and a blogger friend of mine told me my clothes were too big and I needed to go have someone measure me and tell me what size I should be wearing. So, I went to buy jeans, and I did that very thing, I thought she might be right. I was totally shocked and still don’t believe it, but, I walked in wearing a size 10 and left with size 2 jeans! That’s nuts! I was seriously buying clothes that weren’t my size, it was in my head that I was still fat and a size 10 was AWESOME! Even four years later I still struggle with the same thoughts and feelings. When I think of styles and things that will flatter me, I think of the same type clothes I wore when I was trying to cover up all the weight. That’s very true and what a great thing your Mom did for you. It’s good to know there are other people who went thru the same thing. It’s still hard now sometimes. I also think there’s always a hyper-awareness of our weight that will never go away. I suppose that can be good and bad. But, I love that I have taken it off and kept it off!